After the war, Leyland Motors continued military tank production with the Centurion tank. — Cruiser Tanks exploit gaps of the enemy lines created by heavier infantry tanks. — the Comet tank was armed with a 77mm HV which made it one of a few British tanks that could challenge the German Panzers. 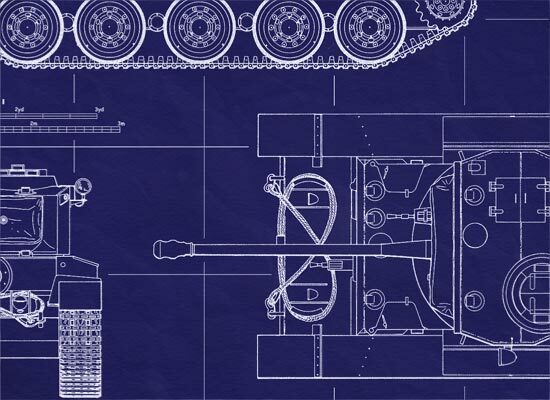 Britain was no slouch when it came to devising armored systems all their own in World War II. 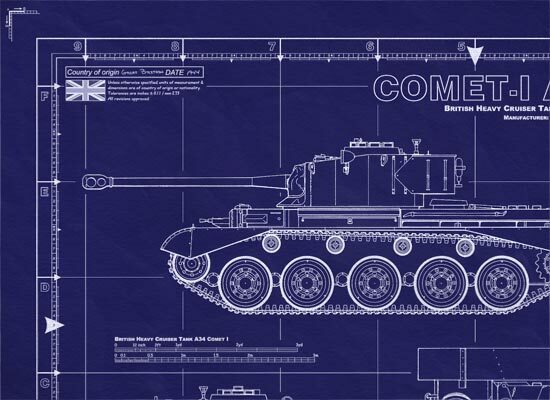 British Comet A34 Cruiser Tank - This is a real blueprint made directly from vellum masters. Delivered to you on a full size master sheet measuring 42"x 30". The blueprint will arrive uncut, edge not slit, or trimmed, and are marked for proper 36"x24" finishing. 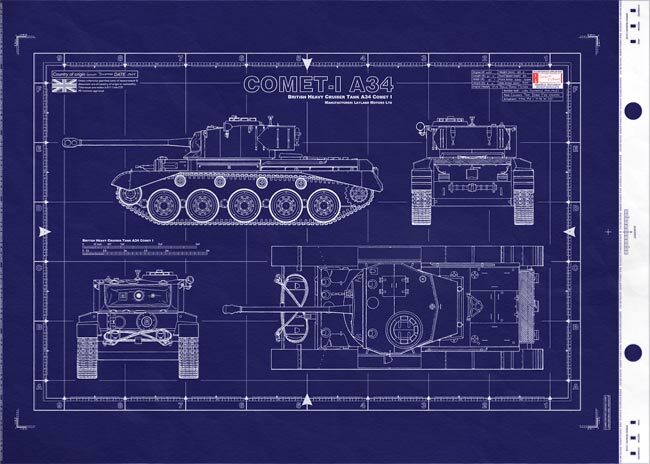 This is a detailed general arrangement plan (standard blueprint cover-sheet) for the Comet A34, one of the most successful cruiser tanks fielded by Britain in World War II. The blueprint will arrive uncut, edge not slit, or trimmed, and are marked for proper 36"x24" finishing. 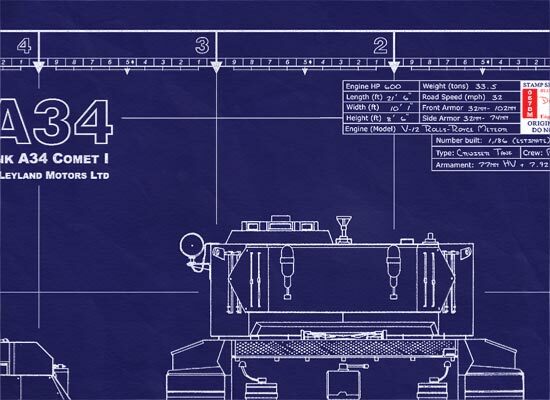 This is a detailed general arrangement plan ( standard blueprint cover-sheet ) for the Comet A34, one of the most successful cruiser tanks fielded by Britain in World War II. Continued from above… the Western Desert in 1941 and 1942 it was seen that the British didn't have guns that were able to easily defeat the German armored vehicles. By late 1943 there was an urgent need for a fast cruiser tank that could defeat German armor. Leyland Motors was approached to take on this task and a design was put forward called the Comet, and this was the machine that went in to production in February 1944. Using many components from the A27M Cromwell but with lengthened & widened Hull, much greater Armour Protection, an electrically operated turret & a new version of the 17 pounder Anti-Tank Gun of 76.2mm caliber this machine was capable of taking on anything the Germans had and with the same speed & maneuverability as the Cromwell. Derived from the Cromwell tank, manufactured in England by Leyland in September 1944, the first tanks appeared on the battlefield in October 1944. Comet, for example, participated in the Battle of the Bulge in January 1945. The 11th Armoured Division was the first Unit to receive Comets in September 1944 and was the only Unit fully refitted before the end of the war, also seeing combat during the Rhine Crossings. The Comet, which was produced between 1944 and 1945, was the last of the Cruiser series, and is generally considered to have been the finest British tank of World War Two, although it only arrived in November 1944 as the British Army was poised to break into Germany. Back in 1941 the British Army requested a Cruiser tank that could carry as powerful a gun as possible which was capable of knocking out any German tank. The first version which fitted the bill was the Challenger, which was on a modified Cromwell chassis with a large turret housing a 17-pounder. This was not considered effective enough, and the search was on for a high-velocity 75 mm gun based on a Cromwell chassis. Vickers-Armstrong developed a 50 calibre weapon that could fire a 7 kg (15 lb) shot which was later redesigned to 77 mm (3.03 in) so that it could fire 17-pounder shells and use readily available cartridge cases. It was a detuned 17-pounder in effect which was smaller and took up less room in the turret. Essentially the Comet was on a Cromwell hull with extra armour, wider turret ring and strengthened suspension. As the tanks arrived to front-line troops, retraining was necessary, and as a consequence Comets did not see a great deal of action before the war ended in March 1945. However, the 11th Armoured Division used them extensively after they broke across the Rhine and swept towards the Baltic. Although the Cromwell's 77 mm gun did not have the same armour-piercing penetrative power as the 17-pounder, it was well liked by tank crews for its protection, speed and, above all, reliability. The Comet continued in use in the British Army until 1960, when it was eventually replaced by the Centurion, which came on stream in 1950. Even after this, the Comets continued to be used as reserve and training vehicles. The Comet was undoubtedly the most powerful British tank to see service in World War Two. It mounted the largest British-made gun and could penetrate 109 mm (4.29 in) of armour plate at just over 457 m (1,499 ft). It was the only British tank to be in any way comparable to the German Panther in terms of its performance and its lethal capability. The Comet was designed to provide greater anti-tank capability to Cromwell tank squadrons. It was armed with a 77mm HV, a derivative of the 17 pounder, with the result it was one of the few British tanks with the firepower to challenge late war German designs. The Comet was roughly comparable to the German Panther , although the German tank entered service 18 months earlier than the British one. Leyland?s new tank was based on the A27M Cromwell (See E1949.342 Tank Cruiser Mark VIII Cromwell IV). Mechanically it was very similar to the Cromwell although it was heavier because the armour was increased in thickness. The increased weight made it necessary to strengthen the Christie suspension and return rollers were added to carry the top run of the track. In the end the modifications to the A27M were so extensive that only about 40% of the parts were unchanged. The Comet prototype was running by February 1944 and following trials the tank was put into production. Deliveries began in September 1944 and the Comet entered service with the 11th Armoured Division in the spring of 1945. The tanks proved to be reliable and the 77mm gun effective. They were well liked by their crews and were considered by many to be comparable to the German Panther. The British Tank, Cruiser, Comet I (A34) first saw use near the end of World War II. It was designed to provide greater anti-tank capability to Cromwell tank squadrons. It was armed with a 77mm HV, a derivative of the 17 pounder, with the result it was one of the few British tanks with the firepower to challenge late war German designs. It remained in British service until 1958 seeing further combat during the Korean war. Comets sold to other countries continued in some cases to operate into the 70s. The Comet tank's top speed was governed down from the Cromwell's 40+ mph to a slightly slower but still respectable 32 mph to preserve suspension and engine components and to reduce track wear. The 11th Armoured Division was the first to receive the new tanks in December 1944 and the only division to be completely refitted by the end of the war. The hull and turret were all welded which were part cast and part rolled. A stronger suspension was needed and return rollers were added. The cupola for the commander was the same as on the Cromwell and provided good all around vision. The turret was traversed by electrical power from the main engine. Armored storage bins were over the tracks and behind the turret. The Comet was the last of the British Cruiser tanks and the last British tank developed during the Second World War. This last of the line of Cruiser Tanks begun before WW2 still featured Christie-type suspension, unlike earlier tanks it combined the three attributes of firepower, mobility and protection well with a 77mm gun with good anti-tank ability, the Meteor tank engine derived from the very successful Merlin aero-engine and a reasonable amount of armour. The A34 Cruiser Tank Comet was the first British tank to begin to match the overall performance of Germany's PzKpfw V Panther. It was designed to match German firepower, speed and protection, which the Cromwell and the Centaur could not do. A completely redesigned main gun was mounted to the Cromwell. Known as the 77m, it performed about as well as a 17 pounder, but was smaller and lighter. Gun was actually 76.2 mm, but was called 77 mm to avoid confusion with the 17 pdr. It could penetrate 130 mm at 30? at 2,178 yards using APDS ammo. Based on experience in Normandy, exhaust cowls added to help reduce the visibility of the Comet at night. This also helped with carrying infantry. They were sent to Belgium in November 1944.